As the maker of the first wrist chronograph and the first fully automatic chronograph, Breitling is practically synonymous with chronograph. 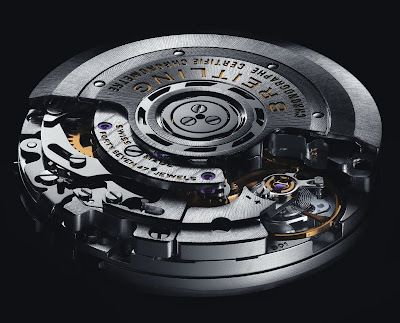 In celebrating its 125th anniversary, Breitling is asserting itself by launching the first in-house automatic chronograph movement, Caliber B01 in May 2009. 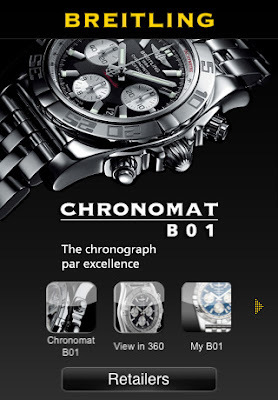 Now, Chronomat B01 is available for all iPhone users virtually. The Chronomat B01 application provides a functional and detailed presentation of the latest Breitling chronograph, entirely developed and crafted in the brand workshops. A precise description, technical data, a portfolio, a video and 360° views give an extremely clear idea of the exceptional nature of the new Chronomat. Also, the application is equipped with a unique configurator serving to visualize hundreds of possible customized versions of the model. 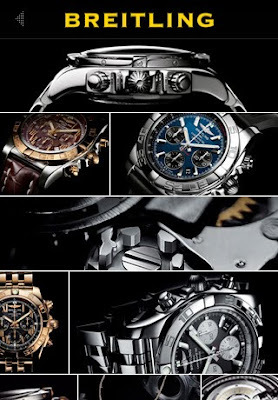 The point-of-sale location-tracking system enables all devotees of mechanical chronographs to localize the nearest authorized Breitling retailers. However, I will opt for Highfield. A fragrant bouquet of passionfruit. A pleasant lime after taste. Highfield is richer in the bouquet of passionfruit. 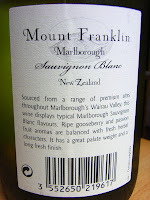 Tastewise, Mount Franklin is a bit thin and short. 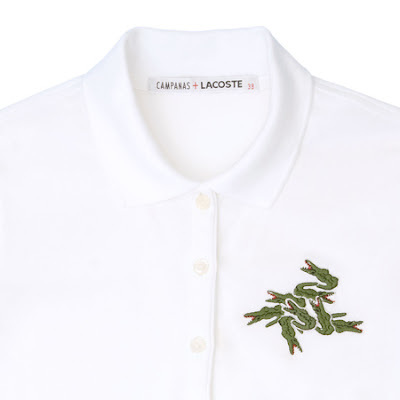 Having great success in the past series, Lacoste is bringing us another surprise in the fourth Holiday Collector's Series. 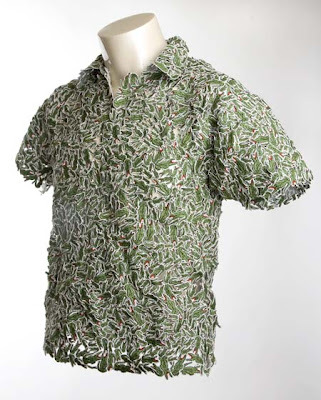 The Campanas + Lacoste series features shirts with arrangements of embroidered reptiles. 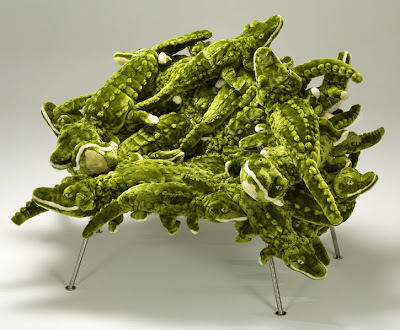 They are references to both Lacoste’s crocodile motif and the designers’ Alligator Chair which is upholstered with cuddly toy alligators. Wow! 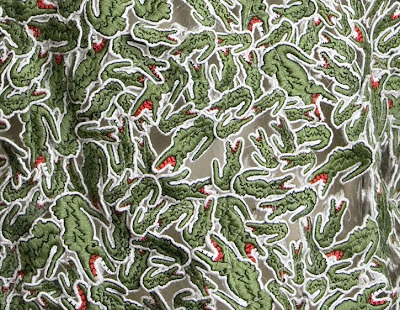 Hundreds of Lacoste's Alligators! The super limited edition will be made to order only with up to 12 men's and 12 women's editions created, it is hand-crafted completely from crocodile logos, recalling the lace work of Northern Brazil. It is simple and direct. If you like something very dry, it would be a fun choice for you. You will not be disappointed by it's strong lemon-like nature. 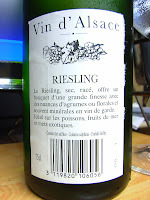 Though it is lack of beautiful aroma, this wine is crisp, very dry and refreshing. Clean on the finish. No weird aftertaste. Beerenauslese is a dessert wine-style late harvest wine. 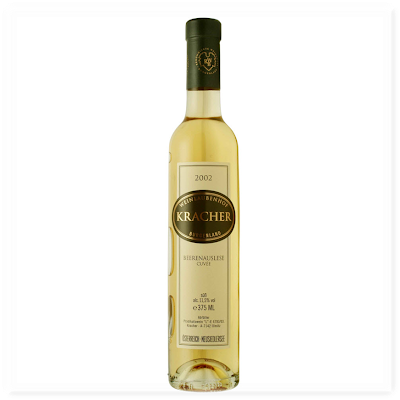 It is made from individually selected fully botrytis-affected grapes that have shriveled about half way. It is not made in many vintages because conditions need to be ideal for the grapes to ripen to this extent, so these wines are very hard to find and expensive. They are usually packaged in 375ml bottles, and are incredibly rich with creamy honey and raisin flavors. Trockenbeerenauslese is also known as TBA for short. 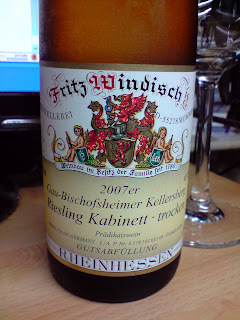 It is the highest category in the Prädikatswein category of the German wine classifications. 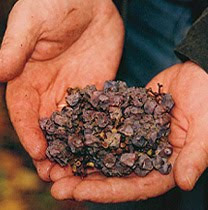 The grapes are individually picked and shrivelled with noble rot, often to the point of appearing like a raisin. 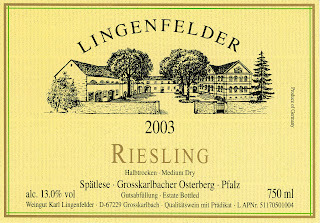 As the grapes are dried by botrytis and very little juice is yielded, this wine is not produced in many vintages. 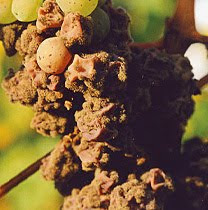 They are dependent on weather conditions, which determine whether botrytis wines will even be possible in a given year. Producing these dessert wines is expensive and labor-intensive. Ultra-rich and deep golden orange in color, it is the liquid gold in a bottle! 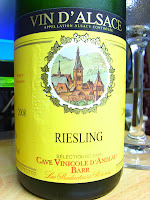 If you are in love with Sweet White Wine, Germany Riesling is definitely your beloved (except Trocken). 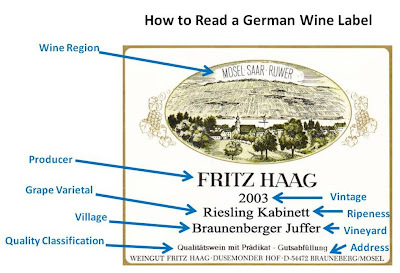 However, German wine label is never easy to read. 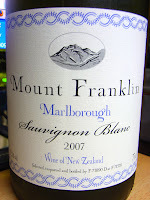 Fully ripened light wines from the main harvest, it is the lightest and usually driest from the QmP wines. They make great apertifs, and pair well with ham, chicken, fish, and seafood. They are never considered as sweet, and labeled as Trocken (Dry). The grapes are harvested about a week later than the main harvest. They are fuller and richer in body than Kabinett (which is due to a higher sugar content). Often (but not always), they are sweeter and fruitier than Kabinett. However, they are sometimes made in a Trocken (Dry) or Holbtrockenk (Medium Dry) style that pairs well with spicy cuisine and heartier chicken, pork, or seafood dishes. They are also delicious on their own, showing great balance of spicy fruit and crisp acidity. Basically, the gold capsule wines have one ring at the bottom of the capsule, and the long gold capsule wines have two rings. Made from selected bunches of very ripe grapes, these wines tend to be on the sweet side, yet still exhibit some crisp acidity on the finish. The grapes are often "botrytized" or (a wine covered in mold, Botrytis cinerea), lending rich honeyed flavors. 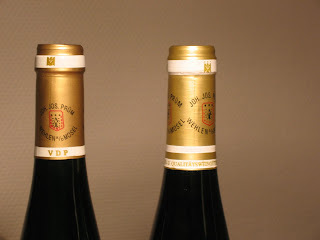 These are among Germany's finest and most characteristic wines, and should be enjoyed on their own. 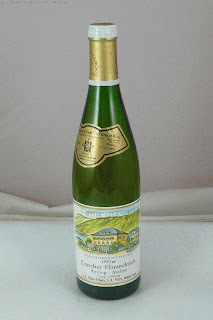 Some growers distinguish their finer "reserve" bottlings by using a Goldkapsel (Gold Cap) or Lange Goldkapsel (Long Gold Cap) over the cork, indicating richer, rarer, and more expensive Auslese. They can cellar for decades. A fragrant bouquet of passionfruit rushes into my nose! Lively acid lingers on my tongue. Definitely better than Cloudy Bay.